With its striking, newly-designed front end and it's aerodynamic profile, the luxurious 2016 Toyota Avalon is a force to be reckoned with. This delicious, sporty upscale sedan can be found at Lakeland Toyota in Lakeland, FL, serving Brandon and Plant City. Our amazing sales professionals are devoted to offering you a fantastic car buying experience and taking the hassle out of the process. So if you're ready to get behind the wheel of a gorgeous Toyota Avalon, let's make it happen today! The elegant 2016 Toyota Avalon gets its smooth and quiet ride courtesy of precision engineering and an efficient powertrain. Raise the hood and you'll find a potent 3.5L V6 engine generating 268 horses and a healthy 248 lb-ft of torque, and paired with a six-speed automatic transmission with paddle shifters. To improve efficiency and to complement your driving style, three modes -- Sport, ECO, or Normal -- kick in at the push of a button. The Sport mode helps to delivers stiffer steering, and the ECO aids fuel efficiency, which is impressive with its EPA-estimated 21 city/31 highway mpg -- not bad for a luxury sedan of the 2016 Toyota Avalon's caliber! 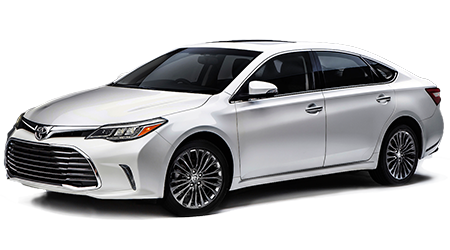 You'll find six find the 2016 Toyota Avalon extremely well-equipped in its six models offered --the base XLE, XLE Plus, XLE Premium, Limited, XLE Touring and XLE Touring Sport. The base XLE features 17-inch alloy rims, leather seats, heated in the front, a power driver's seat, rearview camera, and heated power-adjustable outside mirrors. The Plus adds more than a sign with a moonroof to look at the Florida's skies and a universal garage door opener. You'll add cutting-edge tech in the XLE Premium with a navigation system and wireless charging for your mobile devices. The Limited adds luxury appointments such as perforated leather seats which are heated and cooled in the front, HID headlamps to illuminate the road ahead with precision, and a rear sunshade, which will be helpful during Florida's hottest months. And both the Touring and Touring Sport add 18-inch alloys, a sportier suspension, unique front fascia and LED headlights. It's possible to drive a stunning, luxury sedan without having to dip into your 401K when it's the beautiful 2016 Toyota Avalon. Let's explore this scintillating sedan right now at Plaza Ford, so you can park a 2016 Avalon in your Brandon or Plant City, FL driveway this afternoon!